With the holiday season just around the corner, pet parents may have already begun stocking up on dog toys to put under the tree (or the Menorah). So, it’s important to remember: Not all dog toys are equal. While some toys may provide more mental stimulation, or be more innovative, the truth is that some toys can be dangerous. Some toys can even kill. Yet, there’s big money to be made in the pet industry. 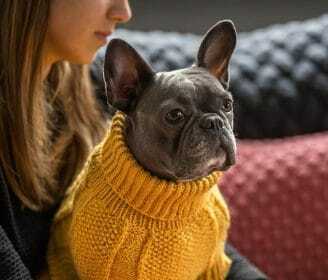 The American Pet Products Association list profits of $69.5 billion in 2017 and an estimated $72.13 billion for 2018. 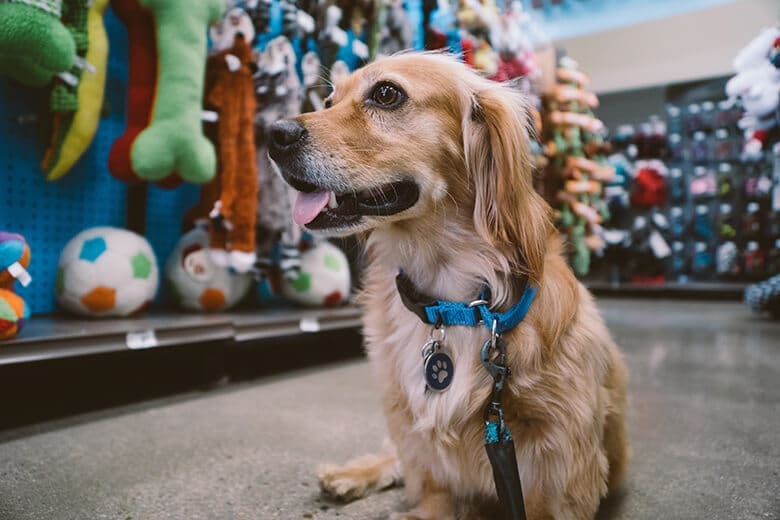 With so many people willing to shell out lots of cash on their pets, large corporations are churning out cheap toys that are not safe — and our dogs can pay the ultimate sacrifice. Just ask the pet parents of the dogs who were seriously injured or died. Maddie, a Labrador, died after swallowing part of a £2 stocking-stuffer Christmas toy. The toy formed a large obstruction in her intestine, and even though vets surgically removed it, she died the next day. Chai, a Labrador mix, had his tongue amputated after getting it stuck in a “Pimple Ball” made by Four Paws (which has since been recalled). By chewing on the ball, a vacuum was created, which sucked the dog’s tongue into the single opening. Dr. Nicole Spurlock of the Animal Medical Center in New York City removed the ball, but it was too late to save the dog’s tongue, which was amputated. Max, a 5-year-old Rottweiler, got his tongue suctioned into the hole in the ball of a Kong Beast. 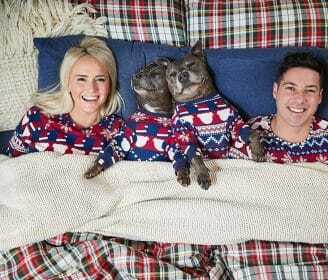 By the time his family realized something was wrong, they couldn’t remove the ball. Though they rushed him to an emergency animal hospital where the vet cut the ball off, it was too late to save the dog’s tongue, and the dog had to be euthanized. While it’s advisable to supervise your dog when playing with toys, we can’t watch them 24/7. But the answer isn’t to banish all the toys from your home. Dogs need toys to keep them mentally challenged, to give them comfort when they’re alone and give them something to do. We all know, a bored dog can be a destructive dog. So, pet parents, choose your toys wisely. Let’s look at the two main issues that arise with dog toys: choking and toxins. What Are the Dangers Lurking in Dog Toys? The hazards of dog toys range from choking to toxic materials. Dog parents need to be aware of potential dangers and how to choose the safest toy for their individual dog. 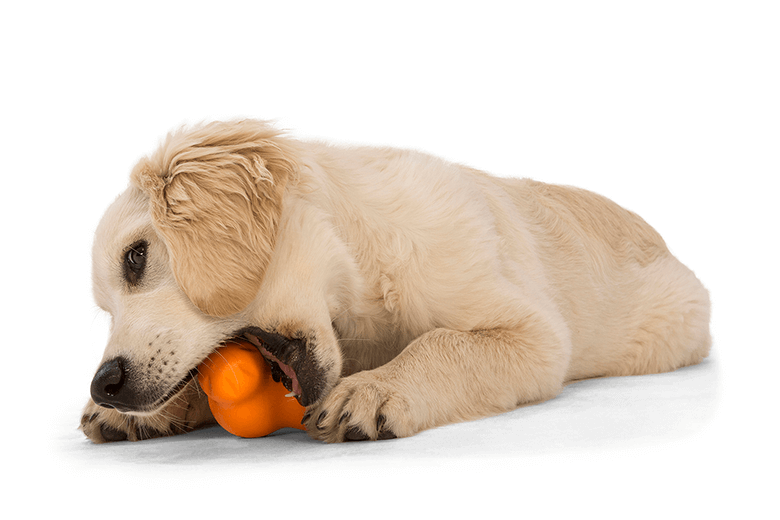 Chewing is good for your dog’s health, so it’s vital that you choose the right size — and material — appropriate toys for them to chew on. 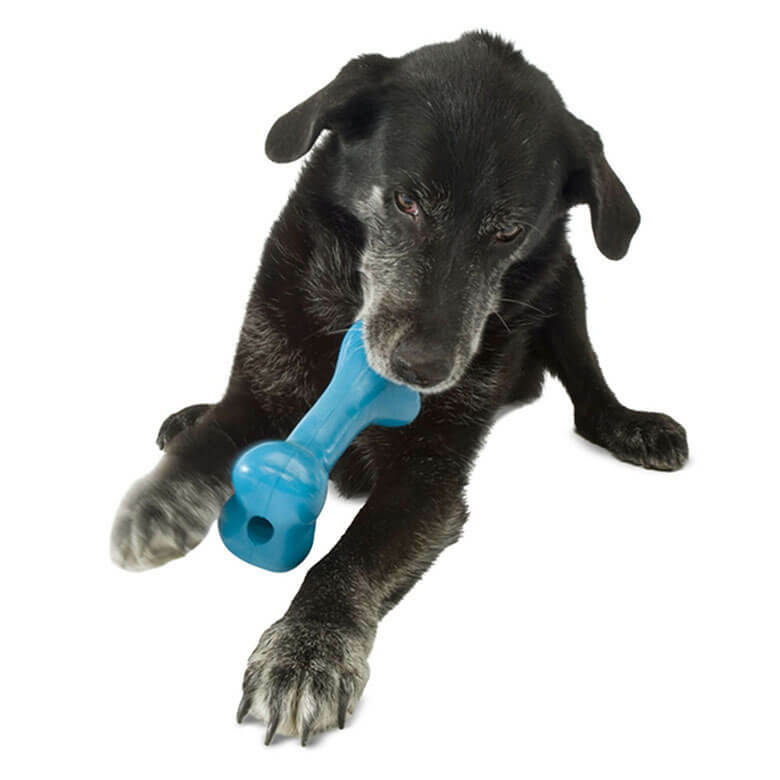 Aggressive chewers: If you have an aggressive chewer, or a dog who lives to rip out the insides of things, make sure your dog’s toys are durable and chew resistant. The material it’s made from should not be so hard that your dog can break a tooth or soft enough that he can rip it apart and swallow parts. If your dog rips apart his toys in a few minutes, try a rubber toy from West Paw, a company that rates its dog toys based on chew style: gentle, moderate and tough. There is also PlanetDog, a company that provides award-winning toys for all chewers, with parents able to choose based on its durability scale. Toys that are too small: A ball, for instance, that’s too small for a large breed is a choking hazard. Don’t pick a toy that can fit entirely in your dog’s mouth — a toy that’s too small can either be swallowed or stuck in the mouth or throat, blocking the windpipe. And look at the shapes of the toy and any openings where a dog’s tongue or muzzle can get stuck. Related: Could This Be the Most Dangerous Dog Toy? A dog that is choking may make retching sounds and looked panicked. A dog that is choking may start frantically pawing at his mouth. You may see the chest moving, but not hear any breathing sounds. You may hear a high-pitched squeaking or whistling sound. In a perfect world, you would have the time to rush your dog to an emergency animal hospital. But it doesn’t take long for a dog to choke to death. You only have a minute or two before the dog loses consciousness. 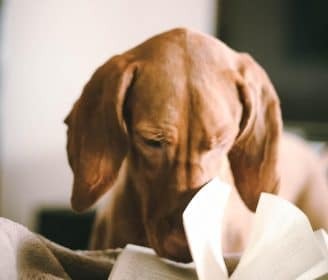 For both large and small dogs, use both hands to open their mouth if you can, pull the tongue forward, and try to grab the object with your fingers to pull it out. 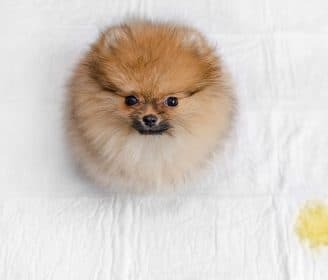 If that doesn’t work, or you can’t safely open the mouth, try this for a small dog: Hold them upside down by their thighs, place your arms around the lower abdomen, and gently shake them. That may dislodge the object. But don’t be too rough, only shake them for a few seconds. 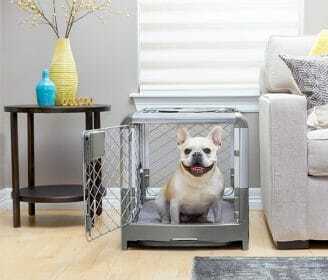 For a large breed, have the dog stand, and pick up the back legs like you’re holding a wheelbarrow. Tilt the dog forward. If these steps fail to dislodge the obstruction, the next step is the Canine Heimlich Maneuver. Place your dog on his side on a hard surface, head tilted down, the hind quarters up. Place one hand on the back to keep him steady. Put the other hand under the rib cage. Press in and upwards four or five times using a thrusting motion. Check the mouth and remove any objects. Stand behind the dog and put your arms around his body. Make a fist with one hand. Put the thumb of that fist against your dog’s body right below the breastbone. Use your other hand to grab your fist. Push up and forward toward the dog’s shoulders. Repeat this motion four or five times. Check for anything in the mouth and remove it. Hold the dog head up against your body with her spine against your chest. Make a fist with one hand and place it on her belly just below the breastbone. Grab your fist with the other hand and give the dog four or five thrusts that go in and upward. If your dog stops breathing, try doing Artificial Respiration and CPR. Besides the dangers of choking on a toy, there’s the risk of dog toys that are made with toxic substances. A strong chemical smell, for example, indicates the use of chemicals such as phthalates and BPA, which are hormone disruptors. 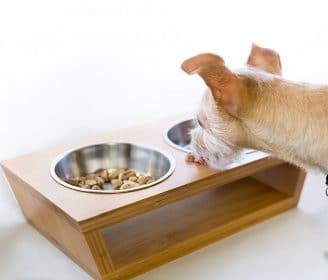 It is reported that phthalates may cause damage to your dog’s liver and kidneys, while BPA has been shown to change a dog’s gut microbiome and metabolism. And then there’s raw hide chew toys that may actually contain arsenic, along with PVC (Polyvinyl chloride), chromium, lead, zinc, melamine, bromine and formaldehyde. Ingestion of these chemicals can lead to a whole host of issues, including vomiting, diarrhea and long-term effects. To find out if a toy is toxic, you can check the Healthy Stuff Archived Pet Supply Data or the FDA’s list of recalled products. Buy your toys from companies that specifically market non-toxic toys. Check out Earth Animal, West Paw, Planet Dog Jax and Bones, Funny Fur Organic Dog Toys, and Playology. Don’t let the dangers discourage you from getting your dog new toys often, just choose the toys carefully.